Known for its towering sandstone monoliths, swooping rock arches and painted canyon walls, Zion National Park’s natural wonders place it among the great sightseeing destinations in the western United States. The majority of the park’s land is protected wilderness, open to backcountry travelers on a limited basis. The demand for access is so high that prospective backpackers and canyoneers must enroll in a lottery in order to explore this wild terrain. Yet much of Zion’s beauty is display right from the canyon floor. 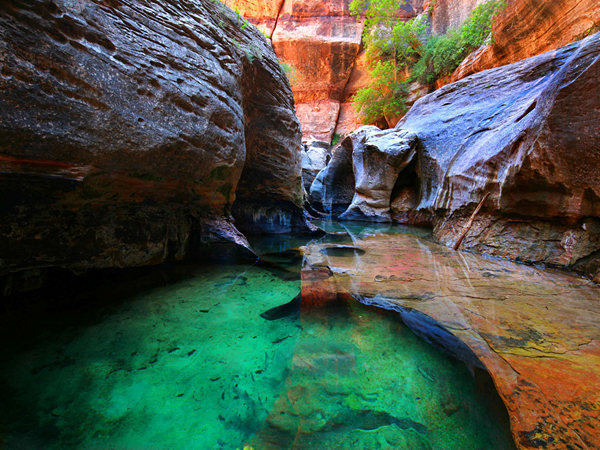 In 15-mile long Zion Canyon, paved roads and accessible nature trails make sightseeing easy. Great White Throne, pillar of white Navajo sandstone that featured prominently on the park’s 1938 WPA poster, can be seen from most points along the Zion Canyon scenic drive. Adventure is often just a bus stop away. To limit car traffic in the park, a free shuttle bus runs through the canyon, stopping at popular vistas and trailheads. While short nature paths and day hikes are common, some of them, like the Angel’s Landing trail, can get pretty challenging. Whether you’re looking to take in nature’s grandeur from a safe distance, or test your limits in the backcountry, Zion National Park has plenty to offer. Click to see a detailed Zion National Park map.